Wood flooring is increasing in popularity as more people appreciate its ability to instantly enhance every of type of space. We all want flooring that’s comfortable, durable, low maintenance, and beautiful, and engineered wood flooring meets all these requirements. Many people also want flooring that is eco-friendly so they can renovate their home or business in a responsible and sustainable way. European Flooring appreciates wood as one of nature’s most extraordinarily beautiful materials, and many woods from our luxury wood flooring collections are certified by the Programme for Endorsement of Forest Certification and the Forest Stewardship Council to highlight our commitment to sound forest management. Installing engineered hardwood flooring in your residential or commercial space can completely revitalize the aesthetic of your surroundings. Hardwood flooring may be an investment, but it will add value, beauty, luxury, and functionality to your space for decades. European Flooring’s engineered wood flooring uses innovative technology that bonds layers of quick-growth, fibreboard wood and tops it with an old-growth, solid wood layer. Our engineered wood flooring is guaranteed to elevate the style and appearance of your space while offering a multitude of other benefits. One of the advantages of luxury engineered wood flooring is resilience. Engineered hardwood is forgiving and easy to maintain. Minor wear and tear can be concealed using maintenance oil, and larger gauges can be filled and stained to match your flooring. Engineered flooring is a more eco-friendly flooring option than traditional hardwood because the top layer is made from solid, old-growth wood and the underlayer made from bonded quick-growth wood. This makes engineered hardwood flooring the best option for sustainable forest management. All of European Flooring’s products are certified by the Programmed for Endorsement of Forest Certification and/or the Forest Stewardship Council, showcasing our commitment to high environmental standards. Because engineered wood flooring is composed of layers of old-growth solid wood and bonded quick-growth wood, which makes it more structurally stable than solid wood. This means reducing shrinking and expanding, making it easier to install and maintain. Engineered wood flooring comes in a range of species and colours, so you can choose the best flooring to complement your space. European Flooring also offers our clients professional and certified installation services for all of our hardwood flooring products. Our expert flooring installers can handle any installation project, from standard to more complex. Choosing the right hardwood flooring for your space and lifestyle needs is easy with the help of European Flooring’s flooring experts. 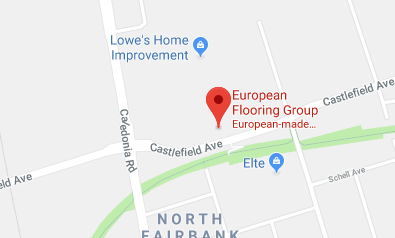 European Flooring’s team is dedicated to offering our clients a wide product selection, outstanding craftsmanship, and quality customer service so you can make the best choice for your new hardwood flooring. If you’d like to install high quality engineered wood flooring in your residential or commercial space, we invite you to visit our designer showroom and shop from our premium engineered wood flooring range.